do script "tesseract /Users/jackson/Downloads/OCRTemp.jpg /Users/jackson/Downloads/OCRTemp.txt"
The problem is that in the line "tesseract /Users/jackson/Downloads/OCRTemp.jpg /Users/jackson/Downloads/OCRTemp.txt" I would like to replace the first file extension with the clipboard. Not being well versed in how to use bash, I'm not entirely sure what to do. 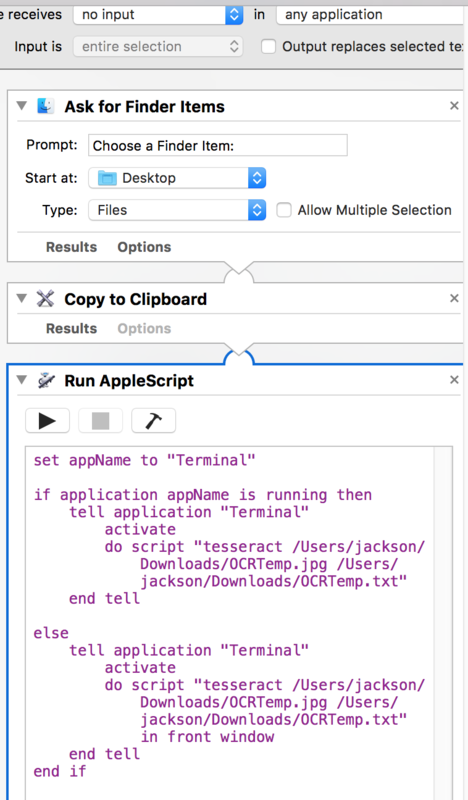 I think part of the confusion is that I'm using an applescript to run a terminal command, so I'm not sure if I use applescript or terminal to get the variable. Find folder on network drive, based on username using bash shell in Automator.